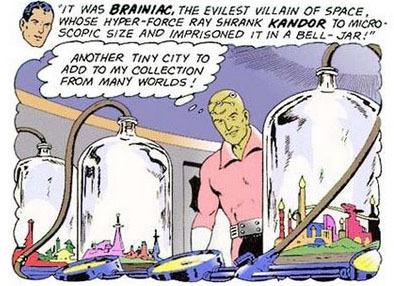 I don't know the whole story of the bottled city of Kandor, from Superman comics. The last time I remember reading about it was in the '60s, so I guess I forgot this panel about Brainiac having shrunk it to microscopic size. Of course, if your city is suddenly microscopic, it had to get that way somehow. 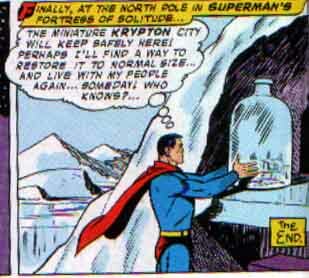 But I do remember Superman having custody of Kandor. Presumably he drops in an occasional gram of food, like we used to feed Sea Monkeys, and everyone there lives happily ever after. If you need someone to look after you, Superman would be a good guy to do it. Superman as I remember him, that is. 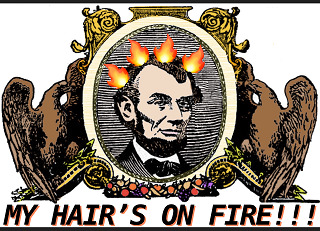 Now that he's renouncing his American citizenship after all these years, it sounds like he's changed. Maybe Superman's no longer an American for some greater good. I hate to question his motives when I have no idea what they are. It's not like I'm a Republican or something. The only thing I know about Superman anymore is what I read in the papers. Just going by some of the pictures they show of him from the comics, he looks a lot tougher and grittier than he used to be. It probably has to do with a more jaded society, where we (not me) like more ambiguity than good versus evil in our super heroes. If I had my way, I would've shrunk him and kept him in my own miniature Kandor, still in his '60s incarnation. But two things would kill Superman, kryptonite, and not being allowed to change with the times. I've been thinking about spiritual matters lately, and a couple weeks ago I was thinking, What if Heaven's like the bottled city of Kandor somewhere? Let's say the souls of everyone are microscopic or not even material, just very subtle, indiscernibly small to even the most powerful electron microscope. You could have billions of them in a square inch. Like billions of bacteria under your fingernail. And so, with a regular bottle, about the size of Kandor in relation to Superman, you'd have quite an expansive place for us to romp, roam, and explore. You would travel a million years just to reach the side of the bottle. Or the bottle could be about the size around of a sequoia tree. That'd give a microscopic soul virtually endless room for venturing into vast uncharted territory. Every time a piece of Sea Monkey food fell in, which is very small stuff, it'd be like the size of the moon crashing around us. Each little quadrant would be provided for like that, plus some other goodies, like a granule of sugar (to us the size of Mt. Everest) every few days, scratch that, every couple thousand years. I'd be happy in there. Look at it this way, it'd be like what we have now. 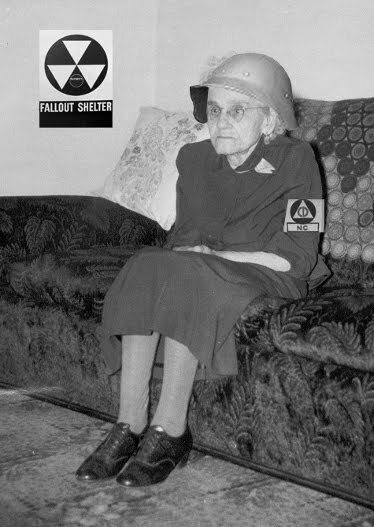 We're more or less restricted to the ground and don't have infinite room to roam. If there were a big bottle enclosing us, that'd be reality, we wouldn't have known anything different, and we'd be happy. Conserving the environment would be keeping our bottle clean. If Heaven's just a big bottle, and let's say we still have our 'trashing the environment' ways, God could just use a transporter to move us to a new bottle. If God had a big roomful of spare bottles, we could easily live there forever. A bottle, Sea Monkey food, and sugar, I'm happy. The fact is, God could be microscopic, and big things just one of God's jokes. That'd be relatively funny.